Despite the widespread cultivation of beans in Africa, yields are low, stagnating at between 20 and 30 percent of their potential. Drought brought about by climate change is the main culprit, afflicting 70 percent of Africa’s major bean-producing regions in Southern and Eastern Africa. 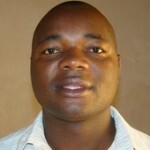 Today we turn the spotlight on Zimbabwe, where drought is a serious and recurrent problem. Crop failure is common at altitudes below 800 meters, and livestock death from shortage of fodder and water are all too common. In recent history, nearly every year is a drought year in these low-lying regions frequently plagued by delayed rains, as well as by intermittent and terminal drought. Zimbabwe is divided into five Natural Regions or agroecological zones. More than 70 percent of smallholder farmers live in Natural Region 3, 4 and 5, which jointly account for 65 percent of Zimbabwe’s total land area (293,000 km2). 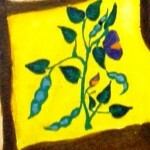 It is also here that the searing dual forces of drought and heat combine to ‘sizzle’ and whittle bean production. The rains are insufficient for staple foods such as maize, and some of their complementary legumes such as groundnuts. In some areas where temperatures do not soar too high (less than 30oC), beans blend perfectly into the reduced rainfall regime that reigns during the growing season. Research from Phase I of the Tropical Legumes I (TLI) project under GCP’s Legume Research Initiative showed that deep rooting is one of the ways to confer drought tolerance in common beans. High plant biomass at pod-filling stage also confers drought tolerance. 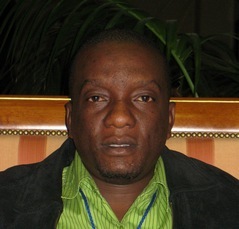 “These important findings from TLI refined our breeding objectives, as we now focus on developing varieties combining deep roots and high plant biomass,” reveals Godwill Makunde (pictured), a bean breeder at Zimbabwe’s Crop Breeding Institute (CBI), which falls under the under the country’s Department of Research & Specialist Services. Zimbabwe is one the four target countries in Eastern and Southern Africa for GCP’s bean research (the other three being Ethiopia, Kenya and Malawi). The battle is on to beat the heat: through the project, CBI received 202 Mesoamerican and Andean bean breeding lines from the reference set collection held by the International Center for Tropical Agriculture (CIAT, by its Spanish acronym). A ‘reference set’ is a sub-sample of existing germplasm collections that facilitates and enables access to existing crop diversity for desired traits, such as drought tolerance or resistance to disease or pests. The Institute also embarked on bringing in more techniques to breed for heat tolerance. 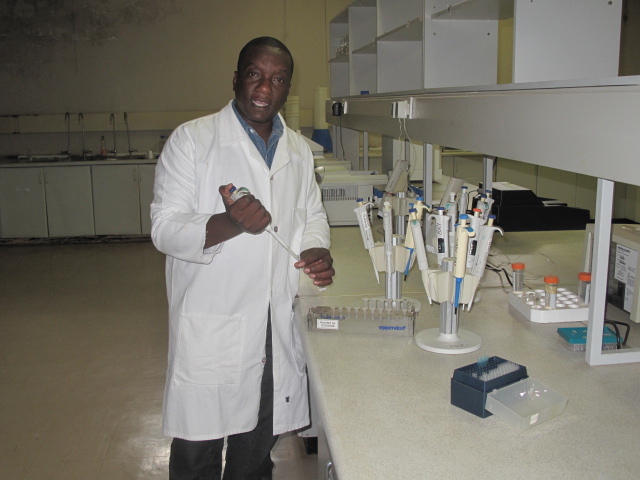 Kennedy Simango at work a the Crop Breeding Institute. At first glance, piling up all these vital survival traits may appear insurmountable, but it is all feasible, thanks to advances in plant science. “Breeding methods are changing rapidly, and it is vital that we keep up with the technology,” says Kennedy. The CBI team is using molecular breeding to identify drought-tolerant parents, and then cross them into preferred bean varieties to confer to the ‘offspring’ the best of both worlds – drought tolerance and market appeal. GCP’s support does not stop at enabling access to breeding lines alone, or introduction to molecular breeding. “We got a lyophiliser, which is specialised equipment that enables us to extract DNA and send it for genotyping,” says Kennedy. “From the genotyping exercise, we hope to be able to trace the relationships among breeding lines so that we design better crossing programmes, and thereby maximise the diversity of our breeding lines. In addition, we hope to select recombinants carrying desirable genes in a short period of time, and at times without even needing to test them in the target environment.” GCP assists with genotyping through its Genotyping Support Service offered through the Integrated Breeding Platform. For phenotyping, CBI has benefitted from a mobile weather station, a SPAD meter (for measuring chlorophyll content), a leaf porometer (for measuring leaf stomatal conductance) and water-marks (probes for measuring soil moisture). Human resources have not been forgotten either. 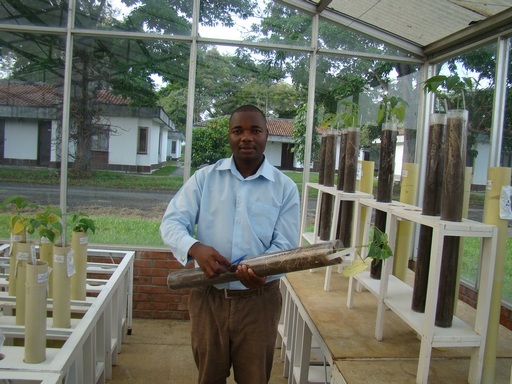 Godwill Makunde, a CBI bean breeder, is studying for a TLII-funded PhD in Plant Breeding at the University of the Free State, South Africa. 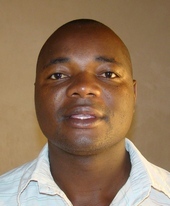 A group of four scientists (Godwill and Kenedy, plus Charles Mutimaamba, and Munyaradzi Mativavarira) are in GCP’s three-year Integrated Breeding Multi-Year Course (IB–MYC). The curriculum includes design of experiments, data collection, analysis and interpretation, molecular breeding and data management techniques. In addition, GCP also trains research technicians. For CBI, Clever Zvarova, Anthony Kaseke, Mudzamiri and Chikambure have attended this training. Their course also includes phenotyping protocols (data collection and use of electronic tablets in designing field-books). To date, CBI has received five tablets for digital data collection , of which two are outstanding. Godwill doing what he does best: bean breeding. “What Mr Mwashita means is that despite the meagre harvests, farm families fare better in terms of health and nutrition for having grown beans,” explains Godwill. With this solid all-round support in science, working partnerships, skills and infrastructure, the CBI bean team is well-geared to breed beans that beat both heat and disease, thereby boosting yields, while also meeting farmer and market needs. Trials are currently underway to select lines that match these critical needs which are the clincher for food security. A noble goal indeed, and we wish our Zimbabwe bean team well in their efforts to improve local food security.